Apparently, England is still special. Someone using the name Younger Dryas (that’s not a real name, by the way, if you don’t know what it refers to, look it up on wikipedia) has noticed something very odd about the temperature in England. There is a series of temperature measurements that has been kept of central England since 1772. This is the longest continuous temperature record anywhere in the world. It is based upon real thermometer readings, not tree rings or any other proxy measurements (although, to be accurate, a thermometer is actually a proxy for temperature, since we are not directly measuring temperature but its effect upon the measuring device). This temperature seris is known as the Central England Temperature (CET) series. It covers a roughly triangular area between Lancashire, London and Bristol. The UK MET Office produces temperature series for the whole of England (as well as Wales, Scotland and Northern Ireland). 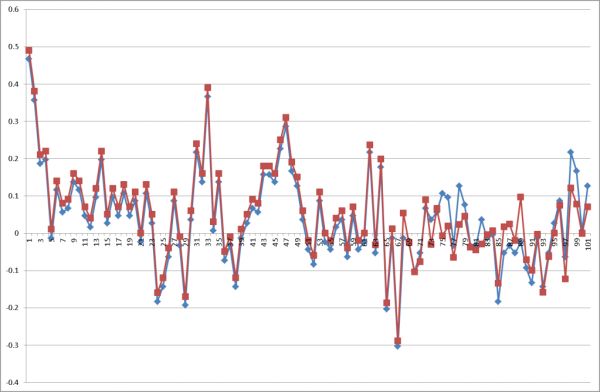 What ‘Younger Dryas” did was to take the temperature readings for the CET, and subtract the average temperature for some period. This leaves the differences in temperature, known as “temperature anomalies”. These are what climate scientists prefer to work with, since it shows only the changes (from some arbitrary temperature) and isn’t masked by the large value of the actual temperature. Around 1992 there is a large difference between the CET temperature, and the MET Office temperature for England. England apparently getting warmer than the CET region. Intrigued by this, our friend then decided to compare the CET series against those maintained by the MET Office for Wales, Scotland and Northern Ireland. He was surprised to discover that the very obvious spike in temperature for England was completely absent when he compared the CET series against these other regional series. For example, the series for Wales compared against the CET series. Exactly why parts of England outside the CET triangle, but excluding Wales, Scotland and Northern Ireland should be getting hotter every year is something of a mystery. My initial thought was that it might be due to the fact that the CET series has been “adjusted” for Urban Heat Island (UHI) effects since 1974. This would lower the actual temperature readings, and if the temperatures for the whole of England were not so adjusted the effect would be to show England getting warmer. However, its clear from the graph that the problem doesn’t begin in 1974, not until around 1992. Also, the effect would be apparent when comparing to other regions. Strangely, this effect kicks in just about the time that the “Oh no! We are all going to die! CO2 is burning up the planet!” craze kicked in. 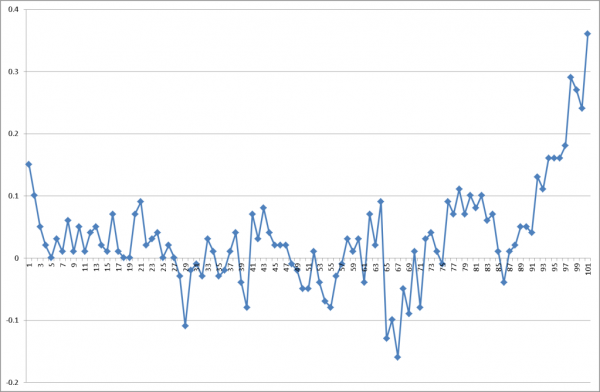 The New Zealand MET Office has been caught adjusting their temperatures to rise every month. Surely the UK MET Office would NEVER stoop to such underhanded tricks? ← Just when you thought life couldn’t get any worse.